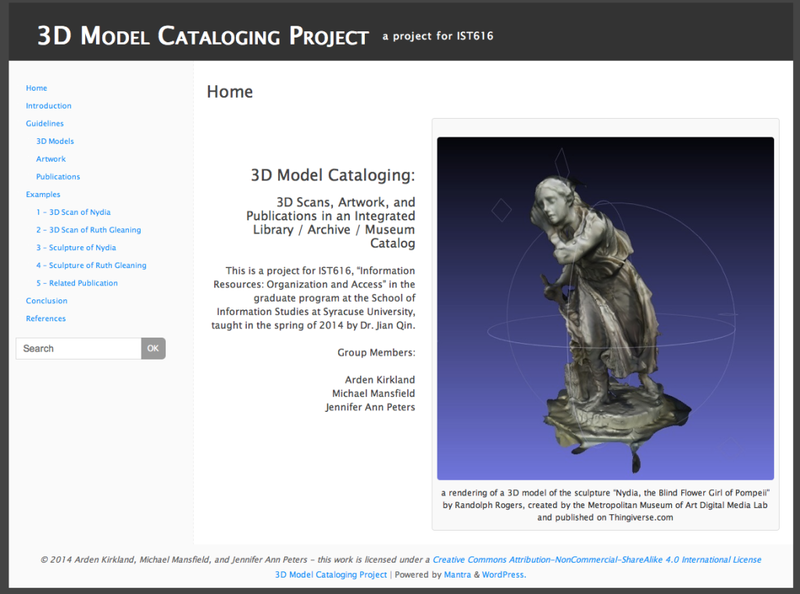 This group project explored the issues surrounding MARC cataloging for electronic files of 3D models created as scans of original artwork at the Metropolitan Museum of Art, and access to them in a hypothetical integrated library, archive, and museum catalog. Examples of cataloging can also be found in my project to develop a Metadata Application Profile (Costume Core), where several examples are cataloged both in XML and in ContentDM. I have also applied aspects of that application profile to projects at Vassar College and the Five College Consortium (in MA), where I have created guidelines for (and have supervised) undergraduate student cataloging work.